Last night ended up having a surprise twist ending, when Colin drank a glass full of tap water without thinking. He was able to spend the rest of the evening, through morning, contemplating his stupidity. Everyone appreciates an opportunity for reflection and self critique. Fortunately, through a combination of immodium and not-having-anything-left-inside, we were able to board our bus to Ha Long Bay as planned, around 7:15. The bus wove its way throughout Hanoi picking up the other members of our group – as you’d expect, mostly Australians, with a couple surprise Canadians thrown in. The ride to Ha Long takes about 4 hours, though it’s only around 80 miles. Traffic and an underdeveloped road network means there’s a lot of poking through towns and stopping to let larger vehicles pass. We made our obligatory stop at the giant souvenir shop. As an added bonus, the shop has a series of long tables set up for embroiders who work while tourists snap photos. 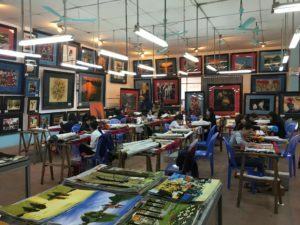 The artisans are all disabled in some way, and notionally the sales go to support those communities. 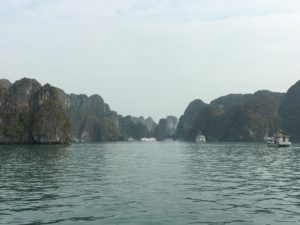 We made it to Ha Long around noon, and boarded our boat, the L’Azalée. The boat has been renovated sometime in the recent past, though it’d be fascinating to know the history of the hull, which is much older. The tour we’re on is pretty structured, but more or less aligned with our interests. 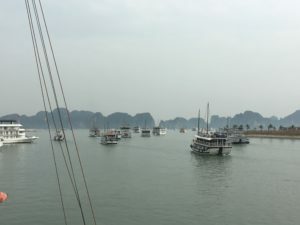 Because everyone getting on a boat is coming from Hanoi, all the boats end up leaving the harbor at about the same time. It’s fun to watch – boats of all shapes and sizes head out into the bay – some just for the day, some for a longer cruise. Once underway, we had lunch (meh) and then had some time to relax. 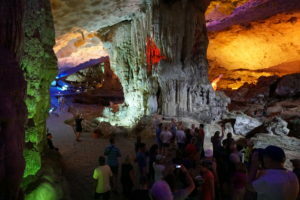 Mid-afternoon, we took our small launch to one of the islands in the bay to explore the largest cave in the bay. 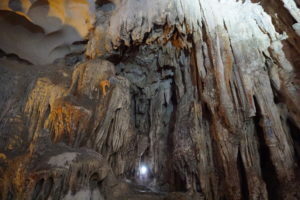 The cave has been extensively modified for tourists – a paved path leads visitors into the smallest of three chambers, then winds its way into the second chamber before reaching the big reveal – the third and largest chamber. 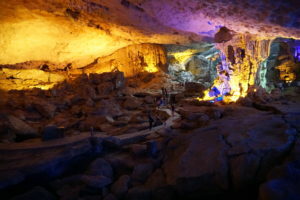 The geologic formations are lit up with bright colors for emphasis. 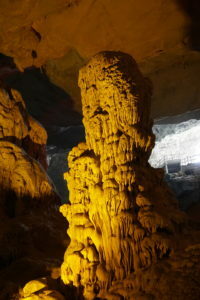 Some of the formations are still growing and it would be nice to see the cave during the wet season. The path winds its way up and out of the third chamber and across a newly renovated walkway to our waiting launch. 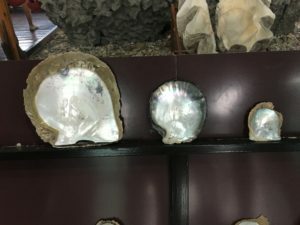 Our next stop was a floating pearl farm, where we got to see the various steps of commercial oyster farming, as well as (conveniently) shop for pearl jewelry. 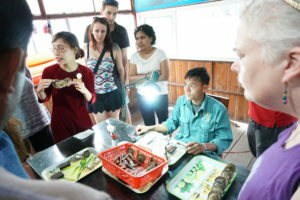 They showed us the three species of oyster from the farm. The smallest takes 3 years to produce an oyster but the largest can take up to 8-10 years. We were then able to watch a technician implanting live oysters with seeds made from oyster shells and a tiny piece of membrane dissected from another oyster. After that our guide opened an oyster and pulled out a new pearl. 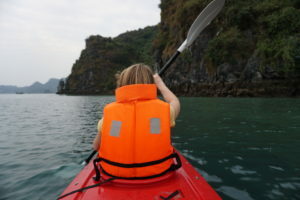 At this stop, we also had the chance to do some kayaking, which was a lot of fun. We poked around the nearby low tide rock walls, visited some of the floating pearl farms, and enjoyed the quiet away from the cruise ships. 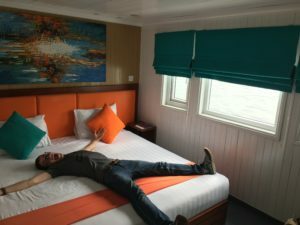 Returning from the pearl farm, we had time to get cleaned up and relax on the ship. Dinner was a bit comical – somehow, in a country with such an amazing food heritage, they managed to make a dinner straight out of 1960s middle America. It’s not a foodie cruise though, so we’ll just focus on the amazing surroundings! We didn’t get much sleep last night, due to Colin’s aforementioned bought of self-reflection, so tonight we’ll be turning in early and looking forward to another lovely day on the bay.